I finished the wedding cardigan in time! 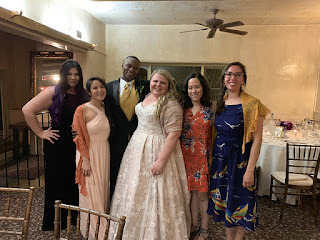 Jill finished all her knitting for Jessie's wedding! She finished the mash-up of Lobelia by Meghan Fernandes and the Pop Crop Cardi by Ambah O'Brien using Jessie's handspun Mork Made Fiber Co. Her project page here. She also made three more stars from the Scintillation pattern by Hunter Hammersen. Her Rav page here. Jill's primary project is still the Marklee by Elizabeth Doherty in Invictus Yarns Reward in the Contemplate colorway. She is also about to start some more Knitted Knockers out of Cascade Ultra Pima. Jill loves the Olive Leaf Pullover by Ririko. She likes the new brioche shawl, Beads, by Andree Beddoe. 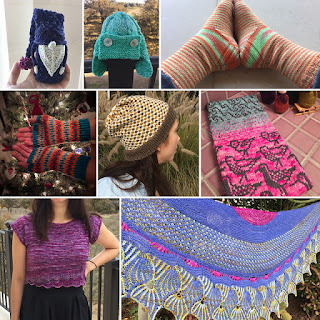 There are also some fun embroidery patterns in the new Summer 2019 Knitscene, like the Oxidation Mitts by Uma Padu, Diadem Effect Beret by Martha Wissing and the New Growth Hat by Andrea Cull. Malabrigo Rios from The Altered Stitch in Studio City (not Burbank!) and Wildfiber Studio in Santa Monica. Jill only brought Marklee by Elizabeth Doherty in Invictus Yarns Reward in the Contemplate colorway. She's back to being monogamous to her Lobelia (by Meghan Fernandes) and Pop Crop Cardi (by Ambah O'Brien) mash-up using her friend Jessie's handspun Mork Made fiber. Her Rav page here. 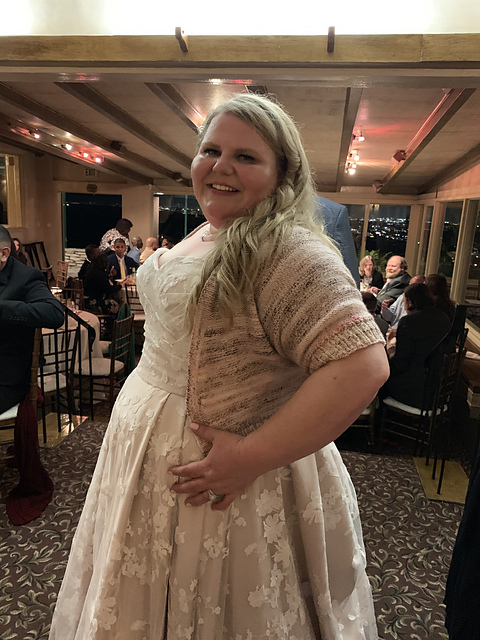 She did a row or two on a Scintillation star by Hunter Hammersen. She keeps meaning to cast on Gnome de Plume/Gnome MKAL by Sarah Schira, but hasn't managed to yet! Jill loves the Soldotna Crop by Caitlin Hunter. 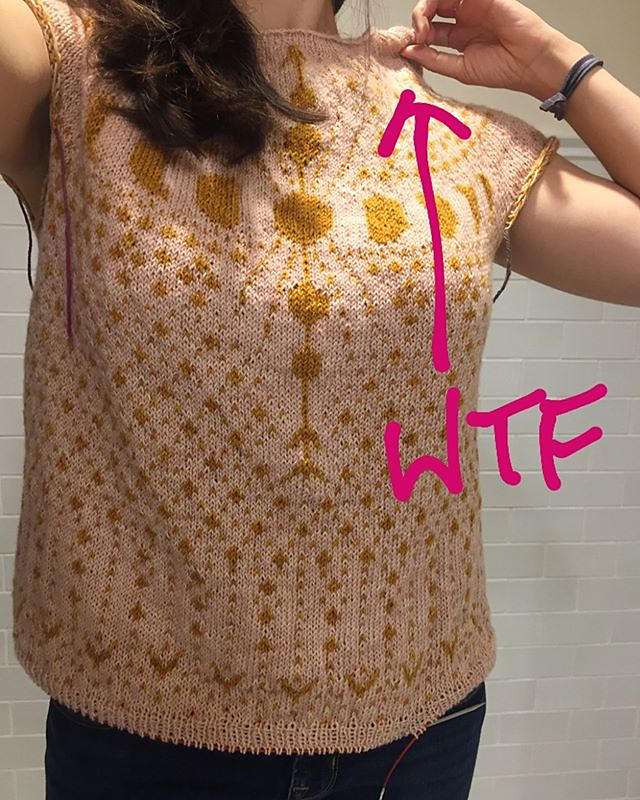 She's also into the Bouquet sweater by Junko Okamoto. She likes the Autumn Gold Shawl by Jayalakshmi, along with some of her other new shawls. Jill bought the Lyne Socks by Dawn Henderson, because they are cute but also because the proceeds were going to the family of victims of the mosque shooting in Christchurch. It's getting harder to find a funny line to make the episode title! Jill is working on her Ixchel by Catherine Clark out of Sweet Sparrow Yarns Gosling in Dusty Rose and Magpie in Butterbeer. She was trying to do the sleeve colorwork in intarsia, but is going to do it again in plain stockinette with duplicate stitch instead. She just split for the armholes in her Pop Crop Cardi by Ambah O'Brien and Lobelia by Meghan Fernandes mash-up out of Jessie's handspun. Jessie spun the 3-ply yarn out of two plies of natural merino, and one ply from a Mork Made Fiber Co batt. 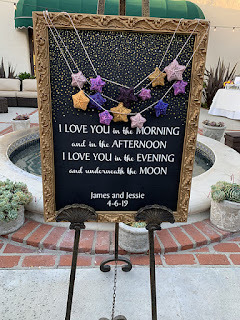 The cropped cardigan is for Jessie's wedding. Jill swatched for Marklee by Elizabeth Doherty in Invictus Yarns Reward in the color Contemplate. She also did a little bit of spinning with Capistrano Fiber Arts 80/20 Merino/Tussah Silk roving in "Barrier Reef". Jill is into the Alaska sweater by Camille Descoteaux and the Oshun pullover by Christina Danaee. She also likes the Vela Shawl by Shara Made. Jill wants to get a jump start on the holidays with the Hello Winter! by Calle del Limon ornament and the Slice of Pizza Ornament by Michele Wilcox. 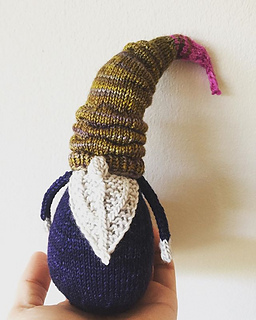 She's also going to participate in the Gnome MKAL by Sarah Schira. Ep. 83 - Why Are We So Awkward? Annie (Petiteweaver) joins me today! Annie finished the Copy.Cat C.C Beanie by Emily Ingrid in Gedifra Metal Tweed in record time. She also made the Blaise shawl by Ambah O'Brien in Undercover Otter Squirm in Killer Clowns froM Outer Space. 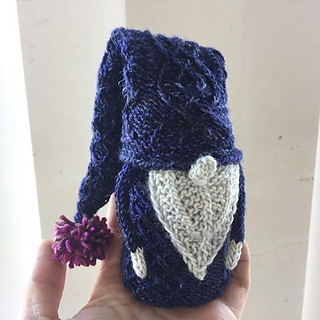 Jill finished her Gnome Pun Intended by Sarah Schira using leftover Malabrigo Sock in Turner and Eggplant. She used the beard from Here We Gnome Again. Her Rav page here. She also made a baby hat using the Anemone pattern by Svetlana Volkova in Berroco Vintage color 51180. Annie is working on Archer by Elizabeth Doherty in Forbidden Fiber Co sparkle yarns . Annie and Jill are both making stars from the Scintillation pattern by Hunter Hammersen. 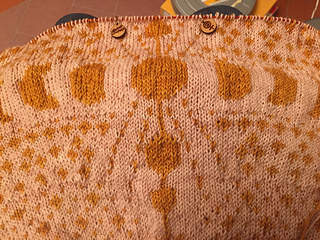 Jill is also still working on her Ixchel pullover by Catherine Clark. Her Rav page here. Annie wants to make the Kobuk hat by Caitlin Hunter, probably in Cascade Yarns Luminosa. She likes her Sabrina Junk Top by Born & Raised Knits so much that she is going to make the Breeze Racerback by Jessie Mae Martinson. Jill is going to make a cardigan for her friend Jessie's wedding, so it will either be Lobelia by Meghan Fernandes or the Pop Crop Cardi by Ambah O'Brien, or some combination. Jill likes the Pineapple Hat by Sonya Marie for preemie/newborn babies. For the crocheters, the Casablanca 12" Square by Maria Bittner. Jill's into the new shawl by Bristol Ivy, Recursive. Jill likes the colorwork pullover Graphica by Casapinka and the Zazie cowl by Anna Maltz using her Marlisle technique. She likes Katemotz's version of the Sturgill Sweater by Caitlin Hunter. Jill knit up the Aki Hat by Svetlana Volkova in Lion Brand Jeans in the Brand New colorway for a friend going through chemo treatments. 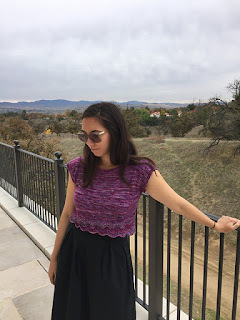 Jill is mostly obsessed with knitting the Ixchel sweater by Catherine Clark in Sweet Sparrow Yarns. The main color is Gosling in Dusty Rose, and the contrast is Magpie in Butter Beer. She has also been working on the Adventurer Cowl by Ambah O'Brien using Fishknits Warm Heart in the NorCal Wildflower Hotspots mini set. She is also making a gnome using the Gnome Pun Intended pattern by Sarah Schira out of leftover Malabrigo Sock in the Turner and Eggplant colorways. Jill needs to start making Scintillation stars by Hunter Hammersen for her friend's wedding! She likes the Strofi headband by Teti/ Nutsknitwear Design and Toph hat by Woolly Wormhead. Jill loves the Panjareh cropped top by Christina Danaee and Milu 3-color shawl by Tamy Gore. Jill made the Ethan the Aviator baby hat by Gabrielle Danskknit in Twist Cotton DK in Cool Mist. Her Rav page here. She finished the Charadriiformes cowl by Sara Huntington Burch in Gnarledpaw Proper DK in Pinko, Mrs. Jones and Knit Picks Gloss DK in Grey. Her Rav page here. She made a pair of Vanilla is the New Black (Sport/DK) out of Gnarledpaw Super Sport in Electric Melon. Her Rav page here. She also made the Picnic shawl by Andree Beddoe in Lisa Souza Deluxe Sock! in Lakeside and Cornflower and Leading Men Fiber Arts Showcase in Barbie's Nighty. Her Rav page here. Her last project for the Giftalong was the Check Slouch hat by Triona Murphy from the Knitscene accessories 2012 magazine out of Cascade 220 in Ivory and Mustard and well as Knit Picks Wool of the Andes Briar Heather. Her Rav page is here. Jill just finished the Aki Hat by Svetlana Volkova in Lion Brand Jeans in Brand New. This is her second attempt. The first one was with Twist Cotton DK. Jill just started the Adventurer Cowl by Ambah O'Brien out of Fishknits Warm Heart in a purple tonal skein and the NorCal Wildflower Hotspots minis (7skeins ~400 yds). A little late for this holiday, but Jill loves the St. Peter Port Stocking by Anne Hanson. There are a bunch of toy patterns, including Myrtil Bear by Cinthia Vallet, Liam the Llama by Brenda K.B. Anderson and Steamed Broccoli Florets by Sara Elizabeth Kellner. She also likes the Betangled Cowl by Jennifer Weissman and the Raspberry Hill shawl by Agnes Kutas-Keresztes. Amirisu - Issue 17 Fall Winter 2018 - Jill likes the Ryusei cowl by Andrea Mowry and the Paleta sweater by Caitlin Hunter. Jill completed a gnome from the Here We Gnome Again by Sarah Schira using Pagewood Farms scraps. Her Rav page here. She also completed Mount Pleasant, a cropped pullover by Megan Nodecker out of Western Sky Knits Magnolia Sock in the Azaleas colorway. 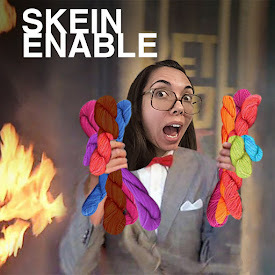 She alternated skeins to even out the variegation. Her Rav page here. Jill is working on the second sock from the Vanilla Is the New Black (Sport/DK) pattern by Anneh Fletcher out of Gnarledpaw Super Sport in Electric Melon. She is knitting on Charadriiformes by Sara Huntington Burch out of Gnarledpaw Proper DK in Pinko and Mrs. Jones as well as Knit Picks Gloss DK in gray. She has just started the Ethan the Aviator baby hat by Gabrielle Danskknit out of Twist Cotton DK in Cool Mint. Jill loves the new gnome patterns by Sarah Schira including Gnome Pun Intended and Go Big or Gnome Home. There are a couple favorite holiday patterns including the Supersize Wreath by Annaboo's House and the Little Christmas Doodad by Melinda Miller. She likes the Switchback Neckwarmer by Nick Davis and the Stoneham Poncho by Diana Walla. Big thanks to Melinda for the Vega Wrap pattern by Shara Lambert!